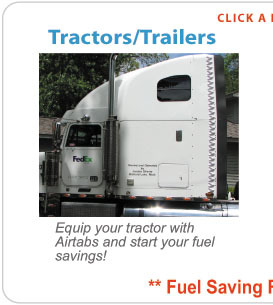 Browse our site and see how Airtabs will save you fuel, create safer driving conditions and help the environment. FUEL SAVINGS | By improving aerodynamic efficiency Airtab equipped vehicles require less power and as a result less fuel to travel at the same speed. GREATER STABILITY | Less turbulent air behind a vehicle means the vehicle becomes more stable on the road and less reactive to gusting winds and weather. 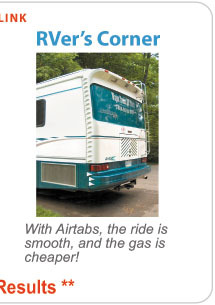 STAY CLEANER LONGER | Changing the way air and water behave with Airtab helps keep the rear of the vehicle cleaner longer. LESS DRIVING EFFORT | Trial drivers reported vehicles "sitting down" on the road better and trailers tracking more directly behind the power unit with Airtabs.